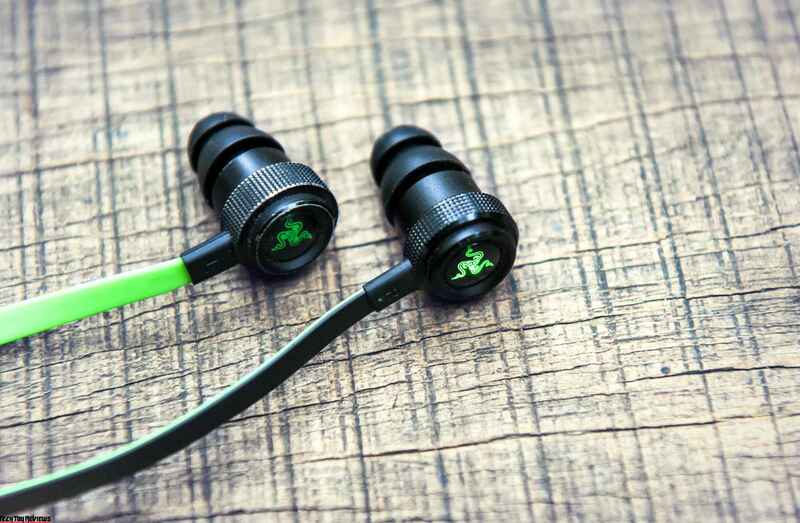 Before launching the Razer Phone, Razer has launched many products for mobile devices in which most notable is the Hammerhead line headphones. The recent version of this Bluetooth headphones is the Razer Hammerhead BT, and it’s the first Bluetooth headphones from the company, with lots of equipment, nice design and quite convenient. This headphones is priced at $99.99, a pretty high price and today in this Razer Hammerhead BT review we will learn more about it. Briefly speaking of what we have in the box, in addition to the headphones there is a high-quality carry case that allows you to fold headphones in it when not in use, compact enough to carry. 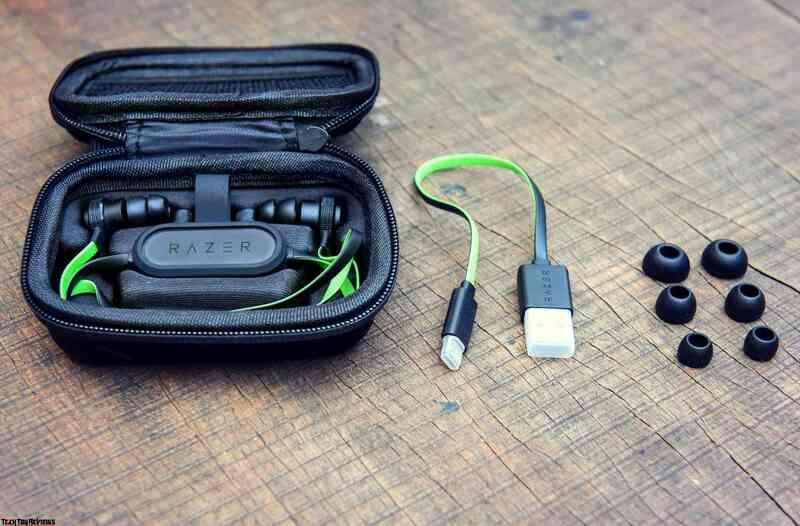 Razer also comes with a microUSB cable for charging and 3 pairs of ear tips with three different sizes to fit your ears. 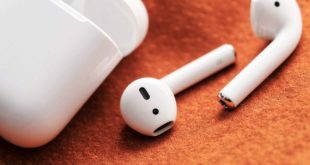 We still prefer to use a pair of earbuds attached to the headset because it has 2 layers and very comfortable for long time wear. The Hammerhead BT ‘s design is not much different from the Hammerhead Pro v2, the Hammerhead BT exterior is made of metal, designed like the Hammerhead Pro v2 with surrounding as gears, Razer logo in the center with adjustable LED lights. Razer is known for making a gaming device and accessories for gamers, so almost any product of this company is also designed in-game style. We have used Hammerhead Pro v2 for over a year, and the paint around the gear has gone, so it’s unclear whether the Hammerhead BT will improve on the material or not? LED lights are a noticeable feature on the Hammerhead BT and for gamers or Razer fans, this is the main reason to buy these headphones. When wearing the Hammerhead BT at night, the Razer logo has a green backlight that blinks in a breath that makes it easy for people to notice it and it also makes the headset more noticeable. 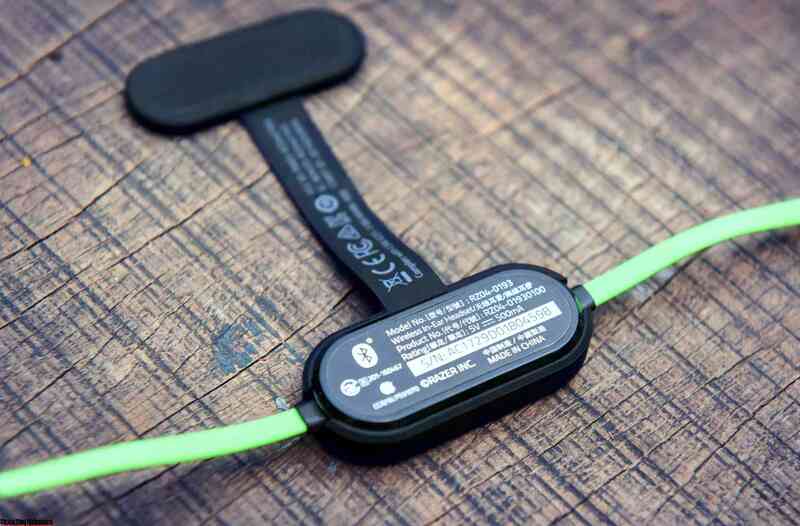 The cable is made of rubber with anti-tangle stripe design, one side with black and another one with Razer green. 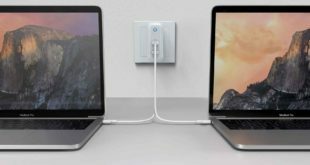 It comes with In-line remote, there must be a mic, power button (including call/pause, play/pause, and pairing), micro USB port for charging and two buttons for volume up and down. What we like is that the whole assembly is compact, located in a solid rubber block, micro USBB port with a rubber cover to protect against water splash. However, these buttons are located under the thick rubber should be slightly hard, harder to press than plastic buttons. The pairing process is very simple and takes only 3 seconds to pair, reconnecting in less than 2 seconds. Hold down the power button on the control panel for a few seconds and watch the LED on the headset blinking green, pause the LED automatically flashes slowly according to Razer’s characteristic breathe effect. Hammerhead BT uses Bluetooth 4.1 codecs for mobile connectivity such as aptX, AAC, SBC, and to use these standards, the player must support these. Bluetooth connectivity on the Hammerhead BT is very stable, with a range of 10 m. During the use, we rarely encounter the music lag due to connection. The most important for all of us is the battery life is definitely more than 8 hours. We have a large battery section which sports the Razer logo and wrapped in flexible rubber that wraps around the battery. It has a magnet in it that snaps onto the back of the battery itself. 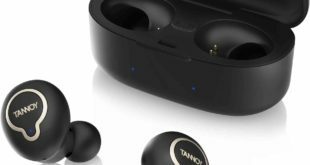 The fixed mechanism of this headphones is also very different from the existing wireless headphones on the market. This battery section is heavier than the rest of the headset and it is located behind the back of the neck. 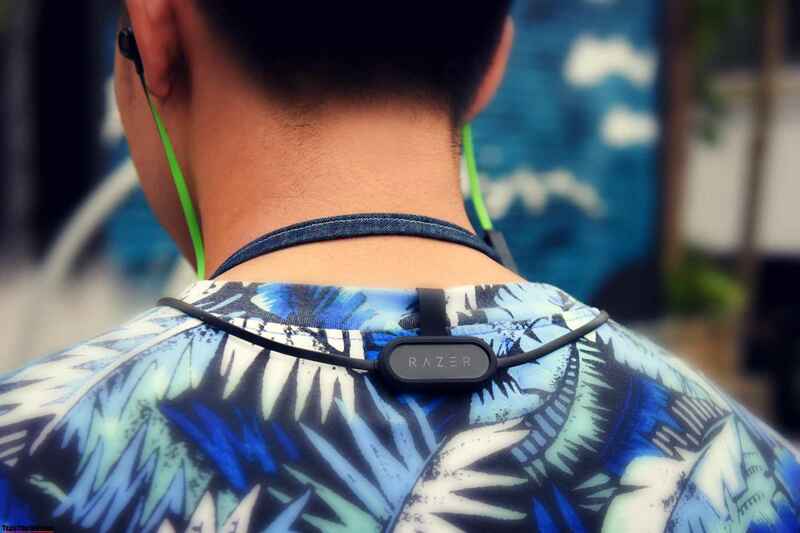 To keep it fixed, Razer designed two pieces of magnets for us to fit into the collar, but not strong enough to hold the battery in place for jogging or doing things that require too much movement. The integrated battery on the Hammerhead BT is 160mAh, takes only 2 hours to fully charge and the battery life is up to 8 hours according to Razer. We try to play music at 70% volume and for continuous playback Hammerhead BT can meet the duration of more than 7 hours, quite close to the theoretical number. For normal use, connect to the phone from the morning when you go to work and listen to occasional music with each hour more than an hour, with this type of usage, you can use Hammerhead BT for 2 days on a single recharge. 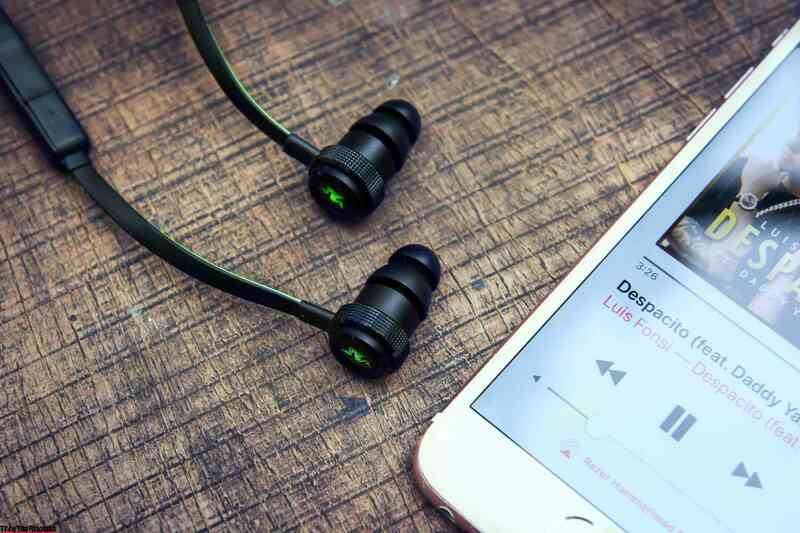 In terms of sound quality, we use the Razer Hammerhead BT every day to listen to music on the iPhone 6S. The bass is just right, not overpowering and slightly overbid, so the bass does not pull the tail without the low bass, so we think it will not please those who like to listen to EDM, also the young generations that Hammerhead BT aims to. We played various music genres with many percussion instruments and above in sections with multiple instruments at the same time. A song like Faded by Alan Walk, if you look carefully will hear the birds sound output to the right ear but Hammerhead BTcannot be. But it has a much better midrange, better vocal range than the rest, good conversation, and better movie soundtracks. The Hammerhead BT has a fairly mid-treble range, ranging from 6kHz to 8kHz. Floating treble can reproduce enough bands but not great, such as the Despacito has a very good guitar. The background noise of the Hammerhead BT does not suffer from outer voice, which is a good thing for Bluetooth headphones. Generally speaking, the Razer Hammerhead BT sound quality is quite balanced, if not too high, the music is quite good with many different types of music genres. 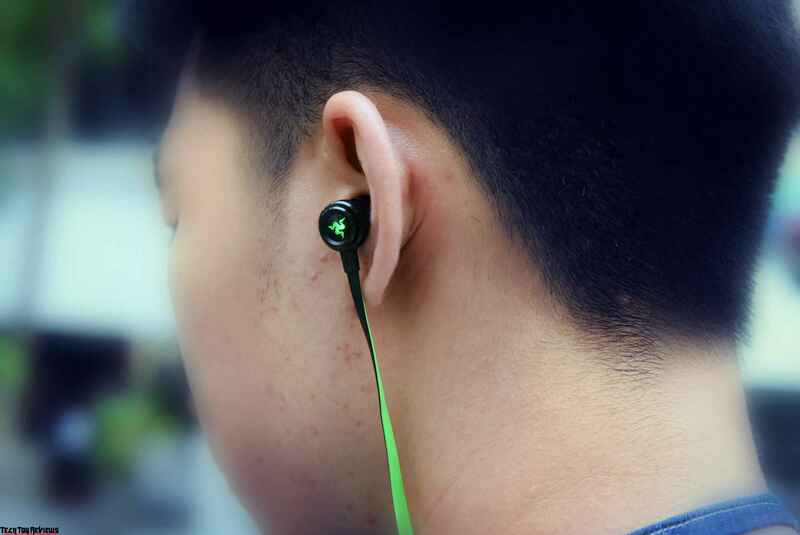 Razer has never been a good earphone, and the company is not prone to headphones to listen to high-end music, mainly focused on gamers with a variety of entertainment content from music, games to movies and Hammerhead BT meets. Mic on the Hammerhead BT is omnidirectional, which will pick up sound from all directions and with a sensitivity of 42 ± 3 dB, it captures good speech at a normal wearing distance. We often hear calls with Hammerhead BT and the other side always hear, not flicker. Even when driving, the other side heard less of the wind. The Razer Hammerhead BT price is $99.99 and can be purchased via Amazon.com. 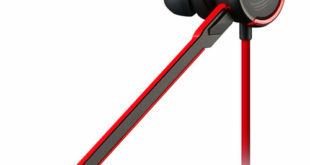 Overall, this Razer headphones offers a high-quality material, long battery life and feature with Bluetooth connectivity is very adequate. Hopefully, in the next version, Razer will improve on sound quality, can add noise reduction features, better bass, improved voice mechanism to fix the headphones.